The 1893-S Morgan Dollar, without doubt, is the absolute key date within the popular Morgan Dollar series. Not only does it have the lowest mintage of all regular issues, it can generally be assumed that few have survived in all grades with only a distinct minority in uncirculated condition. Unlike other low mintage Morgan Dollars no major hoards of the 1893-S silver dollar were ever been found with the exception of a small group of twenty coins that turned up in the 1960s. The current supply of coins have virtually all been on the market for at least fifty years and possibly even longer. Unsurprisingly, examples are always in demand, although lower grade coins are usually available with some searching. While mintages for earlier Morgan Dollars were much larger, it was the recall of the Sherman Silver Purchase act in April of 1893 that created the rarity of the 1893-S Morgan Dollar. Originally, the Bland-Allison Act, which was signed into law in 1878, created the Morgan Dollar series and mandated the U.S. Treasury to purchase two million dollars worth of silver each month. The Sherman Silver Purchase Act, which was enacted in 1890 to replace the Bland-Allison Act, increased the mandated silver purchase amount to four million dollars each month. The mandated silver purchases were minted into Morgan Dollars. Both Acts had significant influences on the Morgan silver dollar denomination. The mandated silver purchases were minted into Morgan Dollars, creating huge mintages. Since the silver dollar was rarely seen in circulation, the coins were stored virtually everywhere. Every Mint, treasury building, and many banks stored millions of freshly minted Morgan dollars, which never circulated. The only exceptions were the Western states, where paper money was disfavored, and hard cash, meaning coins, circulated freely. However, the two western mints in San Francisco and Carson City could easily keep up with the demand for freshly minted silver dollars. In January of 1893, the San Francisco Mint had struck 100,000 coins (per Mint records), and allegedly delivered and released the coins into circulation. Following the repeal of the Sherman Silver Purchase Act in April 1893, no further silver dollars dated 1893 would be struck at the San Francisco Mint. Without the silver purchases required by the Act, there was no longer a need to produce such large numbers of silver dollars since millions were already stored across the country. Thus, the mintage of the 1893-S Morgan Silver Dollar remained at 100,000 pieces, or as recent research suggests, only 77,000 pieces. While mintages of the other Mints were small in 1893 as well, it was the San Francisco Mint which had the lowest. Most sources suggest that the 1893-S silver dollars were immediately released into circulation. Other suggest that the majority of the coins did not circulate until the 1920s, when they were supposedly released in the mountain states. Whatever the true story, it is believed that perhaps 10,000 of the original mintage has survived with the majority in well circulated grades. It is very well possible that a portion of the mintage was melted under the Pittman Act of 1918, which provisioned for the melting of up to 350 million silver dollars that were in storage. Under the Act, a little over 270 silver dollars were melted, and it is very well possible that this included part of the San Francisco mintage of 1893. The 1893-S Morgan Dollar was one of the few issues of the series which was not included on a major scale in the treasury hoards that were released in the 1950s and 1960s. In fact, very few examples have turned up in groups, supporting the theory that all entered circulation and stayed there. Q. David Bowers, who has been active in American numismatists since the 1950s only recalls hearing of a single group of twenty pieces that turned up in Montana. These were all quickly dispersed into the market. Rumors had circulated that a full bag of uncirculated 1893-S Morgan Dollars was included in the Redfield hoard, one of the most famous hoards of coins ever formed. However, not a single example from the hoard has been located and the rumor appears to be a case of wishful thinking. There are a number of key diagnostics that can be used to authenticate genuine 1893-S Morgan Dollars. There were two reverse dies used to strike the coins, and both have a distinctively placed mintmark (upright or slightly tilted to the right). On the obverse, the placement of the “1” in the date should be directly above a denticle. Last, every genuine 1893-S Morgan Dollar, including low-grade examples, should feature a die line in the “T” of “LIBERTY”. The absolute finest known 1893-S Morgan Dollar is the Vermeule specimen, graded by PCGS as MS-67. It is the only coin graded by that service in that grade, and is followed by five MS-65’s. This number does not appear to include more than one resubmission. Only a few are graded in each of the lower uncirculated grades, with most, being heavily bagmarked, grading between MS-60 and MS-63. NGC populations follow the same scheme, with also just a single MS-67 (not the same coin) and three MS-65’s. Again, no pieces graded MS-66 are known to exist. NGC has graded the remarkably “high” number of ten MS-64’s, although this number appears to be heavily influenced by resubmissions. Coins with prooflike surfaces are even rarer. In fact, only a single example has been graded by PCGS with the PL designation, this being an example currently holdered as a MS-62PL. 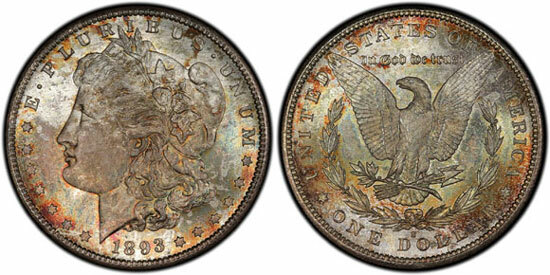 As such the 1893-S is not one of the overall key dates of this popular series, it is also virtually impossible to find with any reflective surfaces. The highest auction price that has been paid for an 1893-S Morgan Dollar was $ 414,000 for the Vermeule specimen, sold in November 2001, when it was not yet certified by either PCGS or NGC. In October 2008, it was reported that the coin changed hands again at a price in excess of $1 million dollars. Circulated coins are more abundant, although still highly prized by collectors. As circulation was so heavy on this issue most are in Good and Very Good grades, although Fine and Very Fine examples can also be found with some searching. Extremely Fine and About Uncirculated 1893-S Morgan Dollars are rarities, and sell for five-figure amounts, whenever they are offered. A heavily circulated 1893-S Morgan Dollar with problems such as cleaning can usually be found for a few thousand dollars.